Are you into campus novels, or do you have a special interest in the academic world? For the good and for the bad, Who's Who When Everyone Is Someone Else flouts the feathers of academia in pretty much every way imaginable. Plot? Check. It's about a professor who travels to a foreign university to give a series of lectures on forgotten works of literature. Structure? Check. Every few chapters the narrative is interspersed with the transcript of a lecture on a made-up work of literature (and these mostly read like real lectures, except with a bit more flourish and punch). Characters? Check. Almost everyone here is a professor, or a student, or an assistant, or a critic of some kind. Style? Well, look at this sentence: "Lives rarely have a clear instance of peripeteia or moments of anagnorisis or epiphany -- most scarcely have a half-decent narrative arc." Unless you've done your BA thesis on Aristotle's Poetics, I doubt you'll know what on earth peripeteia and anagnorisis are supposed to be. Even the word 'epiphany' here throws back to a pretty specific concept in modernist literary theory. Clearly, this is a book addressed to readers with a strong conceptual interest in literature. The lectures on the imaginary books are genuinely well-written and intriguing (if a little hit-and-miss), but they are also kind of inconsequential to the central plot, and their charm will likely be lost to readers unfamiliar with the literary traditions which they echo and parody. With that necessary premise out of the way, the book is quite a mixed bag. The story is recognisably postmodern, but also very accessible and sometimes vaguely amusing. Essentially, this is a journal of epistemological anxieties, a tale about the instabilities and uncertainties inherent to what we think we know: as given away by the title, the protagonist (who remains unnamed throughout, as does his university and the city he is visiting) is introduced to a number of characters, only to find out at every next chapter that the person he met goes by a different name, or has a different job, or is someone's twin brother, or is a stand-in, or is of a different gender, etc. Even the city he is visiting turns out to be indefinite and changing, with streets that seemingly lead to different places every time he walks out. This may all sound like fairly intellectual, sophisticated material, but in truth C.D. Rose's novel manages to treat it with a very light touch. Usually, stories that deal with themes like the above feel quite ponderous (think along the lines of Franz Kafka, Samuel Beckett, or Umberto Eco), but Who's Who When Everyone Is Someone Else never feels slow or exhausting, it's not overlong, and there's a healthy does of irony to lighten the lofty topics. This lightness of execution is an important achievement, especially when considered against the complicated subject matter, but I feel it is offset by the book's equally important shortcomings. The most pressing is self-indulgence: too often the narrator seems persuaded that his anecdotes are a lot more interesting than they really are. Take this passage, in which the protagonist walks outside of his hotel: "Having no guide other than my senses helps with my preferred method, the dérive, the wander away from the main boulevards trafficking me into their commerce, and off into side streets, down alleyways, up steps, across bridges." So yes, the narrator just told us that he likes to take unplanned walks. Am I supposed to be charmed by this banality because he gave it a French name? If I told you that I shaved this morning according to my favourite method, the caresse, which involves passing the razor-blades gently over the skin, would you find this clever or interesting? There are various instances in which the narrator seems similarly out of touch, but nowhere does it get as embarrassing as when he humours his repressed, gleeful racism. The place he visits is described as "a small and somewhat remote city in central Europe which I shall not name". But by the end of his first encounter with a local character (a loud-mouthed, coarse, utterly ridiculous taxi-driver) you know that your feet are firmly planted not in central but in Eastern Europe, or what the anglosphere thinks that region of the world is like. Indeed, it appears that permissible racism has become the genius loci of Eastern Europe, through a combination of the English-speaking public's general ignorance of the region's diverse, rich and ancient cultures, and the fact that Slavic people, in spite of their long, brutal history as victims of enslavement, repression, and genocide, still tend to be lumped with Europeans from wealthier nations as 'generic white dudes'. If Rose's idiotic, bumbling taxi driver had been an Indian cabbie welcoming a British visitor to Mumbai, the racist undertones would be obvious; but with Eastern Europe, let loose your most grating and offensive stereotypes fellas, because anything goes! I may be going out on a limb, but I should add that these misrepresentations are particularly embarrassing for a British writer in the context of Brexit. Presently, in the UK, intellectuals and academics are quick to blame the right for the isolationist attitudes that led to the referendum debacle, yet they are just as responsible. At best, the British intelligentsia consistently demonstrates a tone-deaf ignorance of general European culture beyond the channel, as Rose does in this book, and at worst it pushes radical, embittered post-colonial narratives that vilify European culture more persuasively than the UKIP ever did. But I digress. These brazen stereotypes aside, most of the time Rose knows how to weigh his words very well, and the narrative picks up especially towards the end. This is the part of the book that is most likely to leave one with mixed feelings. On one hand, the final 40 pages or so are the novel's best: the tone stops trying to be quirky and turns more melancholy, while the reflections feel more sincere. On the other, the narrator (and presumably the author) seems so uneasy when faced with the implicit entropy of his field of studies, so anxious about his sense of insignificance as his words are sucked away into the inextinguishable, infinite supply of the very books that he works with, that the whole exercise feels rather pointless. "Nothing is ever its surface," he tells us towards the end, "nothing is ever what it appears to be, even when it is." The contradiction is not suggestive, it is hollow. Having listed out the good and the bad, I'm not sure what to make of Who's Who When Everyone Is Someone Else. It never bored me, but then again, it never particularly excited me. It's never formulaic, but it also never does anything original. It's far from silly, but it's not clever, either. In theory, the mean of all these values should make for a mediocre, average, run-of-the-mill reading experience, but that's neither fair nor accurate. 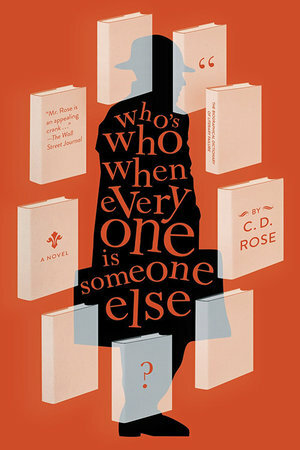 It would be a lot truer to say that Rose's novel is indeed good, but it's good at doing something inessential. It's certainly a well-written tale, but given its narrow target readership, and its insistence on intertextual parody over genuine creativity, I can't imagine this ever turning into a classic, not even as a frolic. The protagonist's lectures are about "forgotten books", and I fear Rose may have produced exactly what he was trying to describe. Or maybe that was the intertextual game all along, in which case, what can I say, bravo.